A band of friends grows up together and goes to work in a niche manufacturing company owned by one of their fathers and serving the private aircraft industry, a risk-averse and highly loyal business segment. Approaching retirement, the father sells a majority interest to a private equity firm, which levers up the balance sheet to normal multiples for such an investment model. The son and his friends continue running the business, successfully preserving longstanding relationships with key customers and a devoted workforce. One day, on a broader stage, senior management of major U.S. automobile manufacturing companies are called to Washington to explain why the government should save them from bankruptcy. All of them arrive, hands outstretched, on their private jets. The press is outraged at such extravagance; the general public, dumbfounded. And suddenly, just like that, there is no market for private jets. The sequence of events when first engaging with the company can go either one of two ways: there is distrust, so integrity fails and progress is hard-fought; or trust is established in spite of what is a potentially contentious relationship, and progress becomes a team effort. A failure of integrity – particularly in an organization with strong interpersonal relationships – portends a hard road ahead, as the organization will be fully focused on internal concerns and ignoring the marketplace and competitors. Striking the right balance between listening and action, empathy and decisiveness, is critical. There are cases – and plenty of them – where intentional misbehavior or dereliction of duty is a deliberate decision taken by management. But most often, especially in lower-middle-market companies such as in this example, management is merely guilty of inexperience. Its attention is focused on getting product out the door and not cash flow projections in the face of newfound levels of debt service obligations. Working through this downturn crisis took place in stages. First, of course, cash flow projections needed better modeling so we could see what we were up against for meeting debt service, and what cost reductions could be immediately implemented. Second, the accounting team needed to be better resourced, which entailed an interim fix-it team and a permanent replacement. While these steps took place, we had the management team focus externally on customer relationships to ensure that we would get a fair shot at any business they continued to conduct, as well as documenting other business sectors where the company’s services could be valuable. A diversification strategy was implemented accordingly. A seasoned CEO and new Directors joined me on the Board, but importantly, the band of friends was preserved, because it was obvious that such continuity in the company’s culture would prove to be incredibly valuable as we took the company in new directions and stretched the abilities (and the work day) of the leadership team. Disruption of the scale suffered by the private aircraft industry can and will happen with increasing frequency and surprise, and without a financial crisis trigger. Uber, AirBnB, and healthcare walk-in clinics are telling examples of recent industry disruptions of this magnitude. 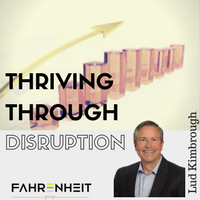 Not every disruption is earth-shattering, but they all must be addressed. The deployment of fractional or interim operating resources to respond to upsets or capitalize on opportunities in the private capital sector will increasingly become essential and expected. Inoculation strategies by investors that enable portfolio companies to thrive through market disruption include recruiting such partners to Boards of Directors and investing in pre- and post-transaction business assessments.